I worked under Gabriel Charles when I first joined the Forestry Division in 1985 and remain indebted to him for his strong support during the early days of my career. As a boss he was tough and demanding yet commanded respect as he projected his deep commitment to the protection of the environment. This piece on Gabriel was published by Right Angle Imaging on behalf of the Government of Saint Lucia in the book entitled Iconic St. Lucians, to commemorate the country’s 30th Independence Anniversary. Gabriel Lewis Charles was born on February 7th 1935 in Dennery and was the brother of St. Lucia’s first Chief Minister, Sir George F. L. Charles. He attended the DenneryPrimary School and then went on to the St. Mary’s College. Upon graduation, Gabriel Lewis gained employment with the Government as an Animal Husbandry Officer in Vieux-Fort. He then attended the St. Lucia College of Agriculture gaining a Diploma in Agriculture/Forestry. In 1957 he went to England where he obtained a Diploma in Forestry from the Gloucester School of Forestry and returned to St. Lucia in 1961. He climbed the ranks within the Forestry division, and became Chief Forest and Lands Officer in 1982, a post he held until 1990. Coco, as he was affectionately known, loved Saint Lucia’s forest and wildlife with a passion. He dedicated his whole life to ensuring that the forests were not destroyed through carelessness and ignorance. He became a well-known figure in Saint Lucia, and traveled through every hamlet, mountain and valley teaching of the dangers inherent in de-forestation. In many respects he was a ‘community activist’ for the cause of sustainable development years before the term was coined as a development paradigm. He was clearly ahead of his time, preaching about the potential negative effects of poor land management practices, a situation that unfortunately characterizes much of our development today. Central to his philosophy was the need to ensure sustainable livelihoods of grassroots people and local communities through education and active participation. As a result he became involved in many community environmental programmes and inspired the formation of many local environmental groups and their leadership. His inspiration and work also transformed the Forestry Division from a small division to a full fledged department and his work has motivated many young St. Lucians within the Forestry Department and outside to pursue careers in Forestry and Environmental Management. 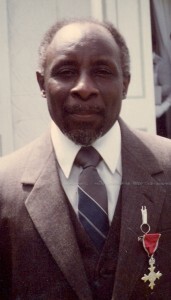 Widely recognized for his innovative development and management of protected areas, he spearheaded the production of the System of Protected Areas Plan for St. Lucia, the enactment of legislation to declare key water catchment areas as central forest reserve and the development of the proposal to establish a National Environmental Commission, which was recently relaunched and established albeit some sixteen (16) years after his passing. Coco Charles was also an instrumental figure in passing the type of legislation which now serves to protect St. Lucia’s flora and wild life and that helped to save Jacquot – the Amazona versicolor parrot. Indeed, upon Saint Lucia’s gaining of independence from Britain in 1979, Coco and colleague Mr. Paul Butler pressed for the Jacquot to be named the island’s national bird. Their persistence was rewarded a year later, for in 1980 when Saint Lucia hosted a meeting of the International Council for Bird Preservation, Mr. Peter Josie, Saint Lucia’s Minister of Agriculture, held up a poster of the versicolor and officially declared the parrot Saint Lucia’s national bird. Coco Charles and colleague Mr. Paul Butler also spearheaded a national public education campaign which saw forestry officials visit every school on the island – explaining the importance of saving Saint Lucia’s Green Parrot and its forest habitat. This successful campaign also included the distribution of stickers, badges and posters, and the erecting of billboards at strategic points around the island. They featured a picture of the parrot, its Latin name, and a simple message “Save Our National Bird” – a message that had a lasting impact upon the Saint Lucian community, and which still resonates decades later. In 1991, the UK-Based World Parrot Trust provided the Saint Lucian division of the RARE Centre (of which Coco Charles was Assistant Director) with a bus dubbed “The Jacquot Express” to help further the Centre’s public education and conservation efforts. As such, the bus was equipped with a portable generator and audio-visual equipment, a PA system and interactive displays. Under Coco Charles’ leadership, the St. Lucia Government successfully launched a parrot breeding programme in 1975 with the Durrell Wildlife Conservation Trust in Jersey, UK, to safeguard against the extinction of the St. Lucian parrot. Since 1975 when the programme started, 20 off spring have been bred. The Trust has invested in extensive research to better understand the diet and breeding habits of the St. Lucian Parrot to ensure the survival of the species in captivity. This remarkable achievement is noted in the International Zoo Year Book published by the Zoological Society of London. On the regional level Coco Charles was considered an iconic figure that elevated the status of forestry to a more embracing profession of environmental conservation and management. At the international level, Coco Charles attended many conferences and seminars and worked with organizations such as WWF, CIDA, EDF and USAID. He served on many Boards and Commissions such as the National Trust and the Parks and Beaches Commission, Water and Sewerage Company and the St. Lucia Natural and Historic Society. 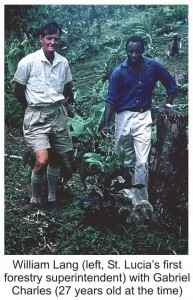 For his contribution to conservation, Gabriel Coco Charles received the prestigious Fred Packard Award, was named a Member of the British Empire and was nominated to the United Nation’s Global 500 list of people who have made an outstanding contribution in the field of conservation. He received this award in Bangkok, Thailand in 1988 alongside the world famous Jacques Cousteau known for the popular TV series – ‘The Undersea World of Jacques Cousteau’. He was a recipient of the prestigious Fred Packard Award, and upon his death on 31st August 1993, was RARE Center’s Assistant Director for Conservation Education. Gabriel ‘CO Co ‘ Charles was really an iconic figure in the field of environmental and forest conservation and wildlife protection. I consider him to be the God father of conservation in St. Lucia. He was the one who sparked my fire for wildlife conservation and forestry when he taught me forest ecology at the Union Forestry College from 1975 -1977. His legacy will live forever. The memory of Mr.Charles just became vivid in my mind and memory. I didn’t know him personally, but i did see him often, as he was my good friends father. We attended the Ave Maria School together for many years. Must say “what a fine job Mr. Charles did with his daughter Charlene. Every now and then she run’s through my mind, and that’s attributed to Mr.Charles, and the wonderful work he did both in his amazing fatherhood,Agriculture and Forestry work. (talking about 22 years ago)He’s an icon to me. P.S. I would love to get in touch with my friend Charlene. If anyone could give her my email address it would be greatly appreciated.